Email is the fastest growing marketing method in today’s corporate world. It fast reaches and also tendency to achieve the target audience has made it successful. Seeing this several bulk email senders have been developed in the market. But there are actually certain points that make this particular method a fruitful process. Email IDs- User doesn’t just need email ids in bulk from internet and different other sources but the useful ones. It is important to get addresses that are essential. You are obviously thinking of getting these Ids. For this you can employ an email extractor that can fetch email ids that you need. If you get the addresses of your target audience then you can easily send mails to them. The Perfect Tool- After you have got the list of your target it needs to be used. 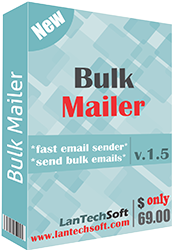 To employ this list you need bulk mailer tool that sends mails to large number of recipients. The tool must also deliver mails at a tremendous speed. Thus employing the perfect tool is evenly important as getting email ids. Matter Matters- Yes, words play a significant role in making email campaigning successful just like email ids. The content of the mail is also important because that the soul of your mail. The content should be to the point so the reader understands it quickly. If the reader gets it he/she will surely buy the product or service. Delivery/Spam- It is important to keep an eye on the mails that whether they are being delivered or failed. The software that you are using should present report of the mails delivered & failed. This will give you status of your reach. Also beware that the mails you have sent land in inbox not in spam. Mails that land in SPAM are of no use. There are lots of tools now that guarantee sending mails in Inbox. Reply Please- Have you heard the sentence ‘Reply Soon Very Positively’? This is an important sentence in mailing purposes. Always request the receiver to send a reply about the product or suggestion to make improvement. This makes the receiver feel great and also gives you an idea of what he thinks about your product. These are the points that are equally essential for the marketing purposes just like getting email ids. Following and paying attention over these will surely give you success.